Clear aligners are a series of invisible, removable, and comfortable acrylic trays that straighten your teeth like braces. Not only are the aligners invisible, but they are also removable, so you can eat and drink what you want while in treatment, plus brushing and flossing are less of a hassle. 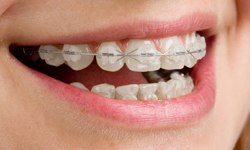 The aligners are comfortable and have no metal to cause mouth abrasions during treatment.